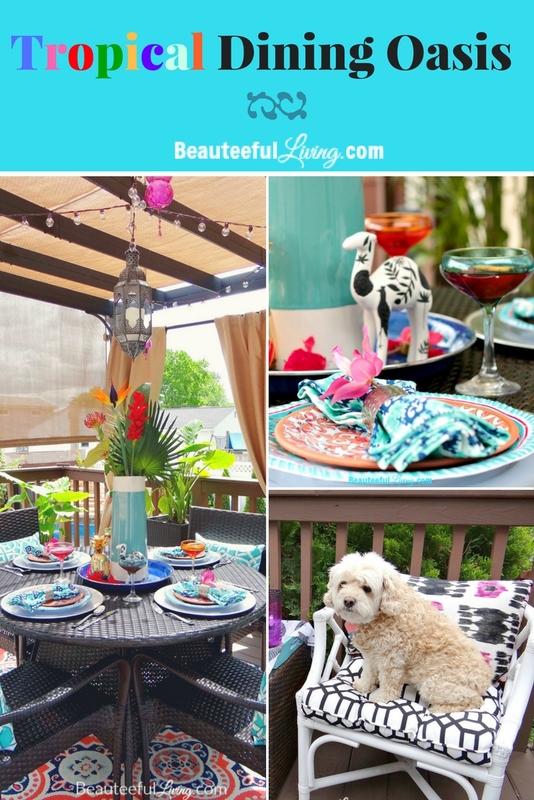 I’m so thrilled to share Beauteeful Living’s Tropical and Moroccan-inspired Outdoor Dining Oasis! Note: Affiliate links are provided below for convenience. For more info, see my full disclosure here. Shopping for this makeover has been a dream since all the elements fell into place quite smoothly. Everything you see in this makeover is quintessentially my kind of style. I love color! I love texture! I love geometrical prints! 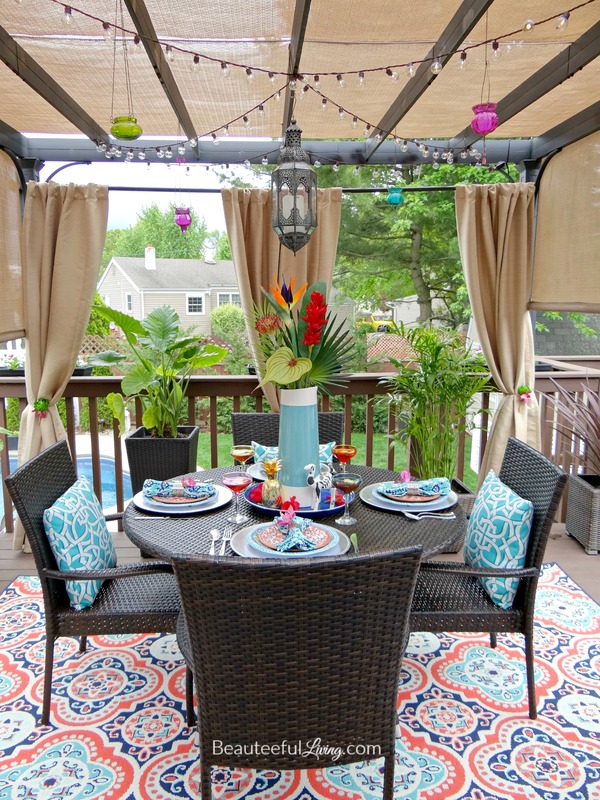 These hanging lanterns from World Market create such a colorful and fun view above! 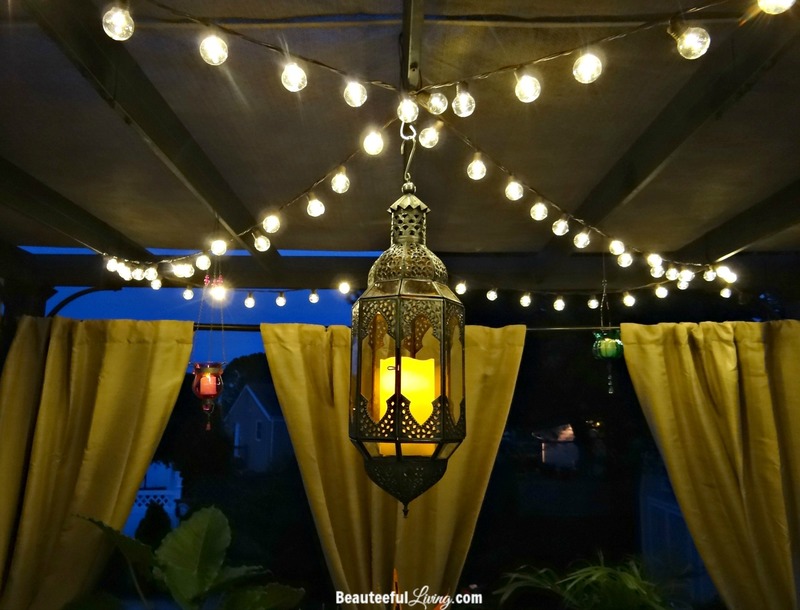 Also, the LED globe string lights provide exactly the level of lighting that we need for our deck. I’m so glad I ordered this dining set from Wayfair. Very impressed with the quality of this set, especially since it was only a little over $300. The chairs came assembled and that round table was so easy to assemble. I did it all by myself. Bragging rights…hello! Finally, I have curtains for our pergola. 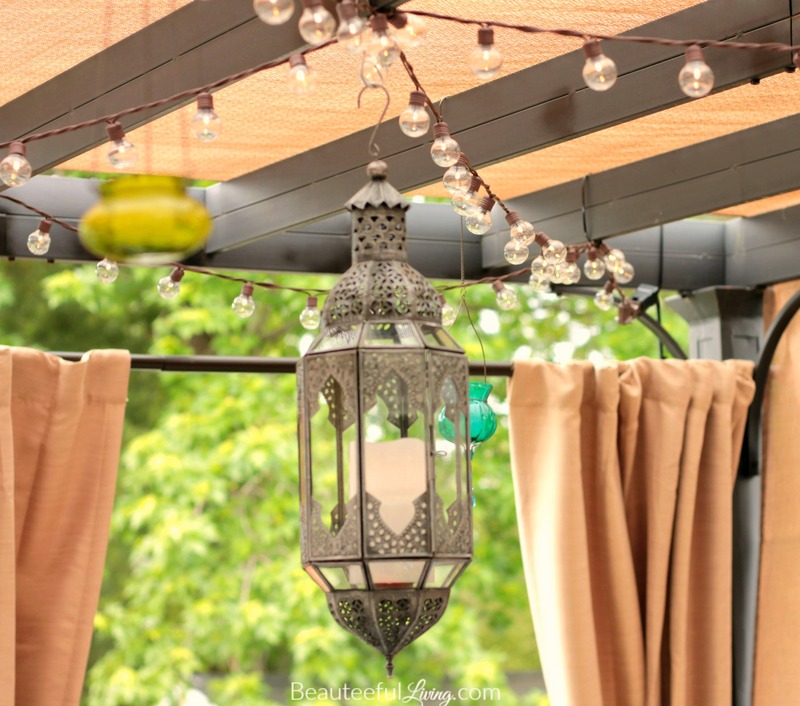 Not only do the curtains project a cozy feel to our pergola space, they provide much needed privacy for the side where the roller shades don’t cover. 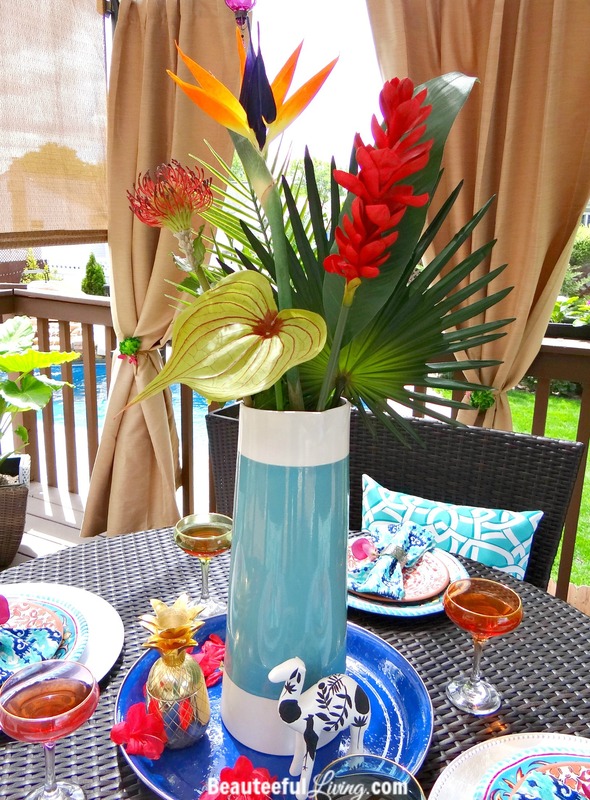 Love those tropical plants? You may recall that I got them from A & M Garden Center. You can’t beat real flowers and greenery but look how realistic these floral stems look! I bought them from Michaels and Hobby Lobby. The gorgeous tall vase is from West Elm. 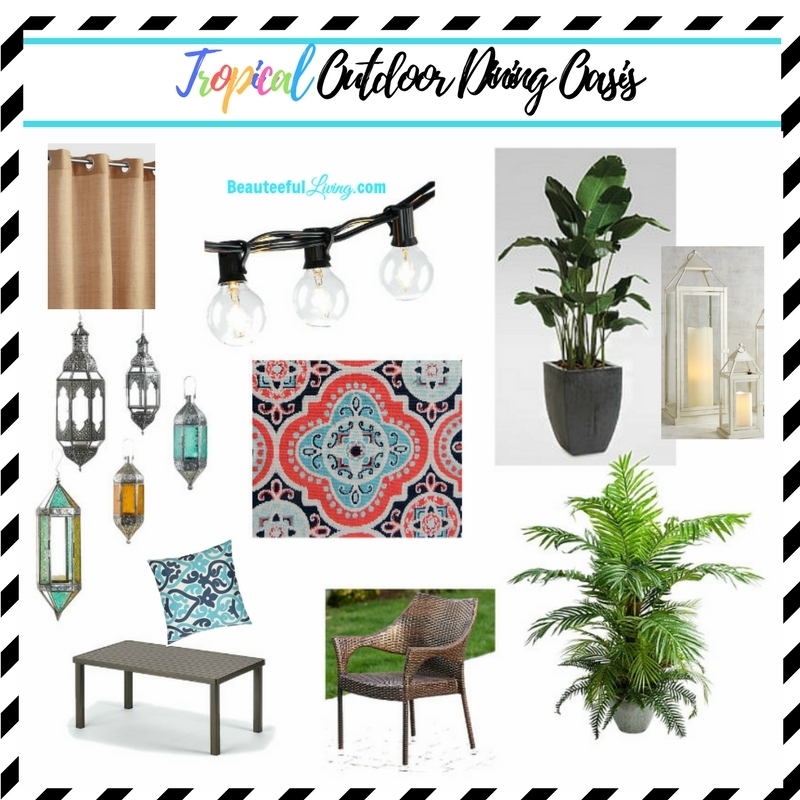 Let’s talk decor accessories. 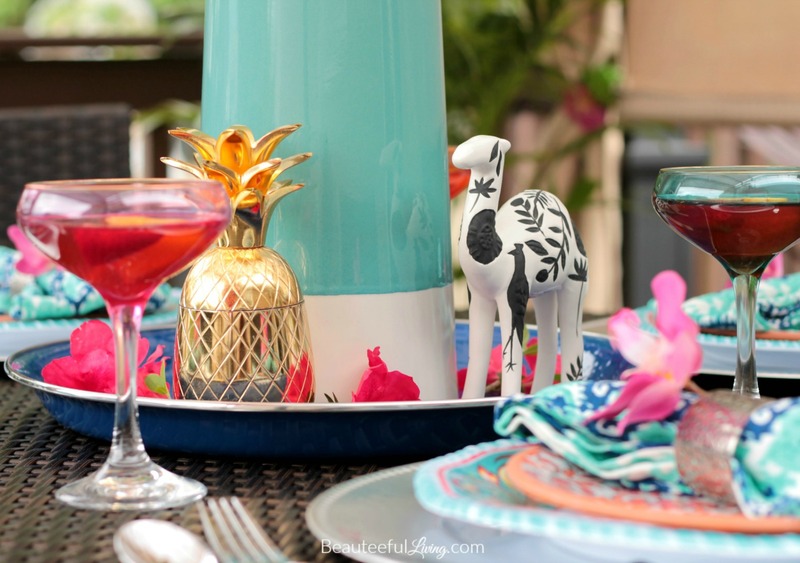 That gold pineapple is from T.J. Maxx while that adorable camel was purchased at Target. The pineapple represents the tropical theme while the camel represents the Moroccan theme from this makeover. Cheesy. I know! Lilly Pulitzer goblets shown below. 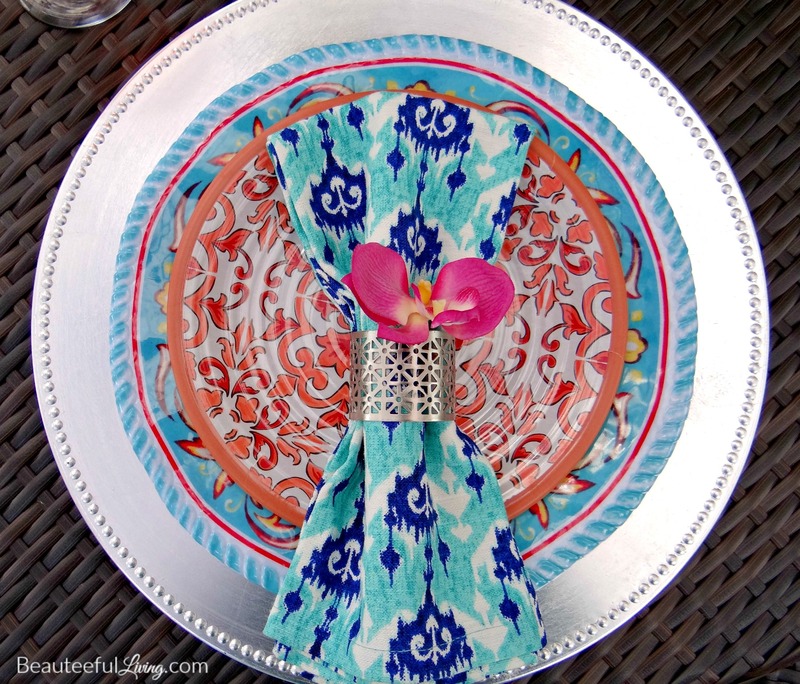 The plates were from various Home decor stores while the napkin ring is from World Market. Cloth napkin can be purchased here. This hanging lantern from World Market is EVERYTHING. I cannot drool over it enough. 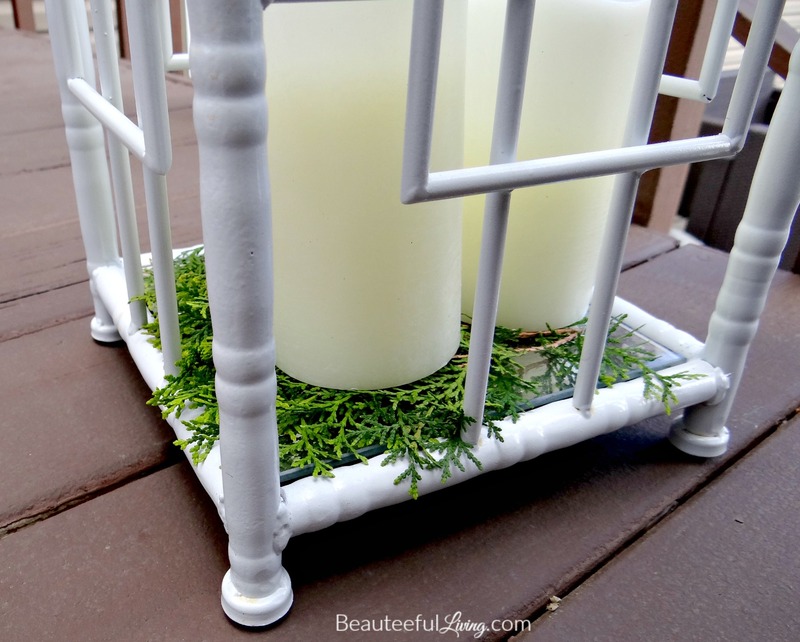 I was so lucky to have found these white “bamboo” like lanterns earlier in the season. They look extra nice at night when the LED candles are on. Aren’t the tropical plants from A & M Garden Center amazing? 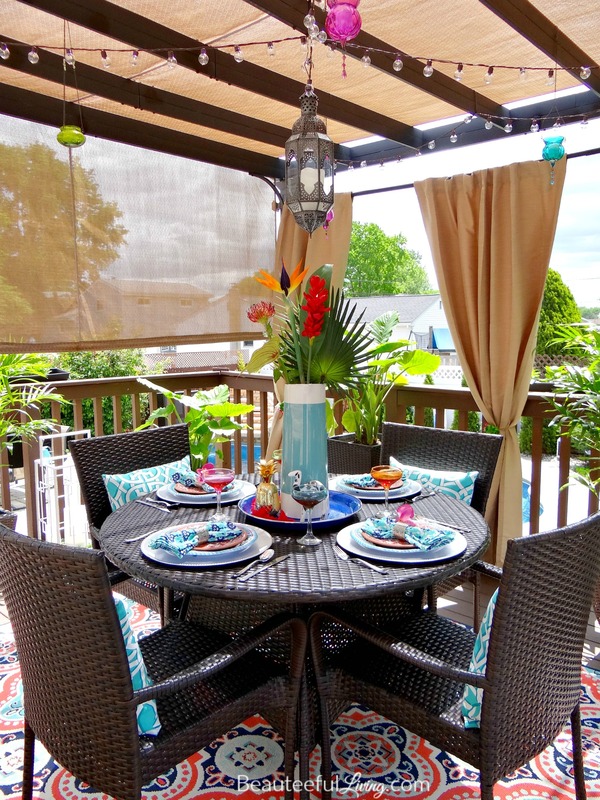 They instantly give our deck a resort-like feel. An expanded view of our pergola area. Every day with sunshine calls for a celebration. Don’t you think? Love that indigo-colored new rug from World Market. Pineapple and strawberries, anyone? 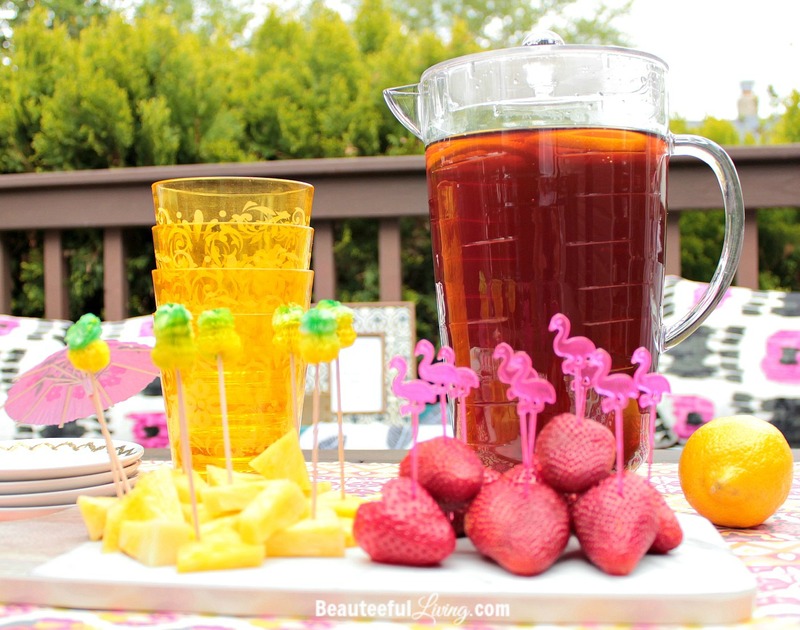 How about a cold glass of iced tea? 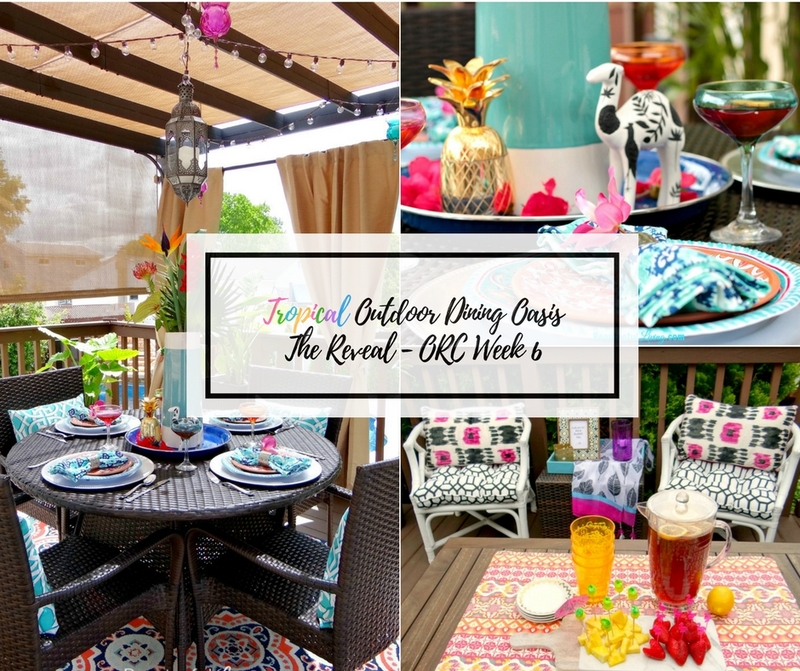 These revamped bamboo chairs is one of my favorite DIY projects to date! Our dog Roxie has not met a chair she doesn’t like. She looks like a stuffed animal here. I love all the decor in this photo but I think she’s my favorite prop! Definitely the most expensive! Haha. Looks like a tropical fruit party going on over in this corner. Love this pretty sign from Michaels. 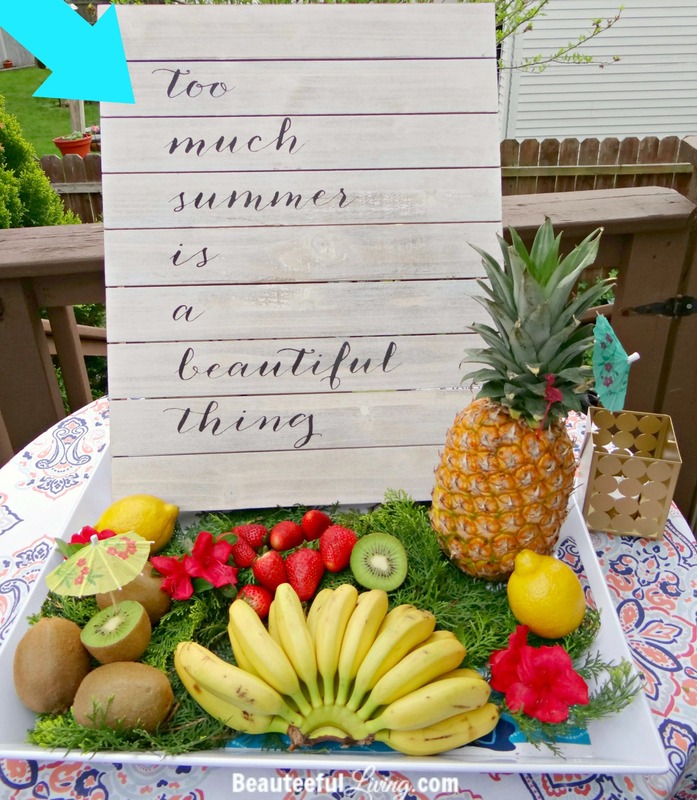 “Too much summer is a beautiful thing.” Like…seriously. The view of our upper patio from my bedroom upstairs. View from our pool’s water slide. Ooooh… The NIGHT TIME photos now! Fancy this makeover? Please PIN/Save/Share. Thanks a bunch! I’d like to extend a BIG THANK YOU to World Market and A & M Garden Center for being sponsors of my guest participation in this spring’s One Room Challenge! This makeover would not have been complete without their products shown. Also, special thanks to Michael Daferede for photographing a number of photos featured in today’s blog post. Lastly, please be sure to check out the 20 designers featured HERE on their amazing reveals and the guest participants linking up HERE. I cannot wait to check out all of these amazing reveals (thanks to Linda from Calling It Home for hosting this bi-annual event). So much creativity and inspiration out there! Happy reading! Xoxo, Tee. 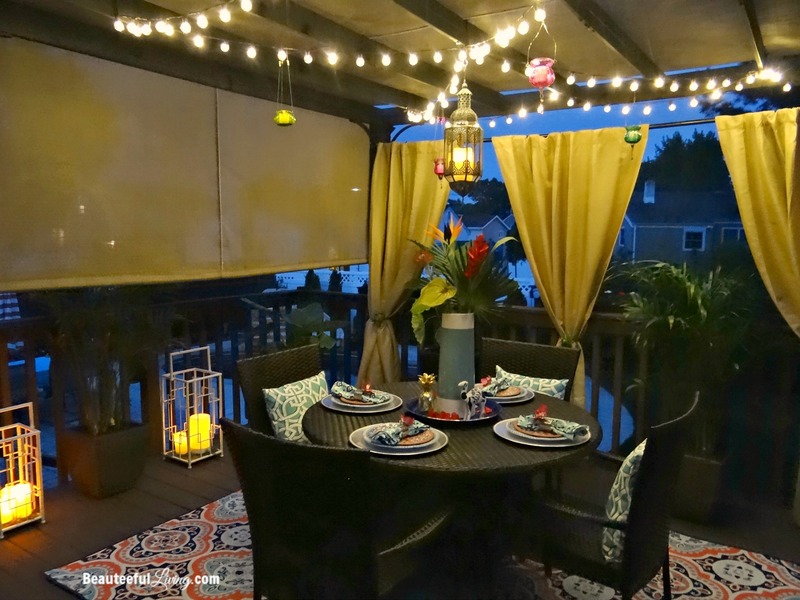 I LOVE you back deck makeover!! I’m searching for ideas on how to make my deck much more entertaining. 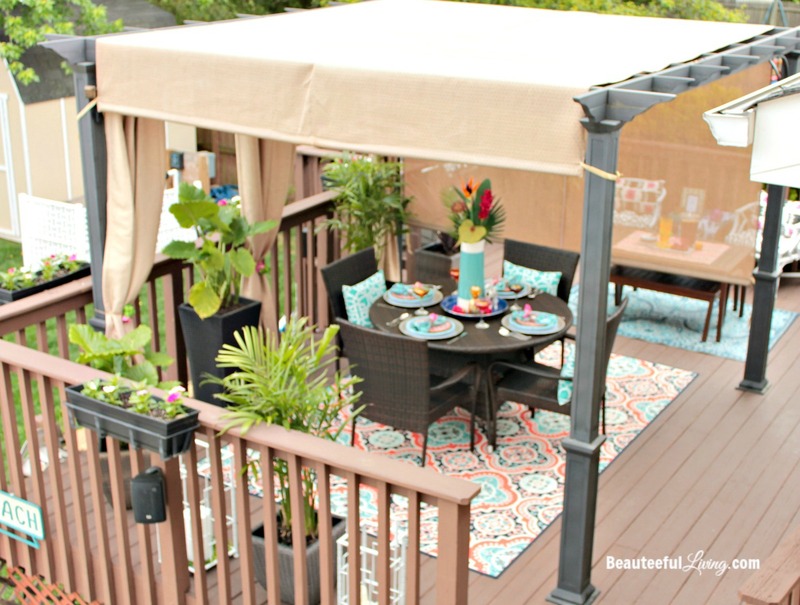 Where did you get your pergola cover? 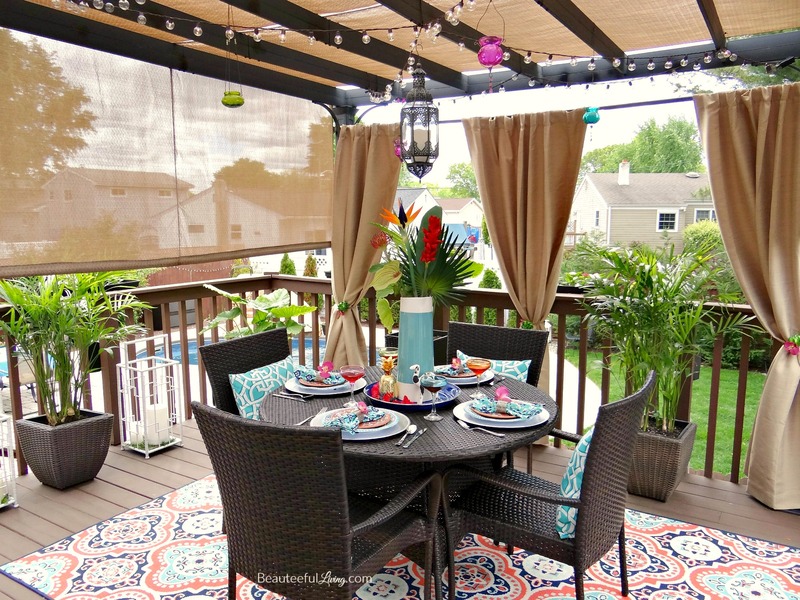 Good luck with making your deck more inviting! Happy decorating! How is the Deck Over holding up? Is it the original coat? 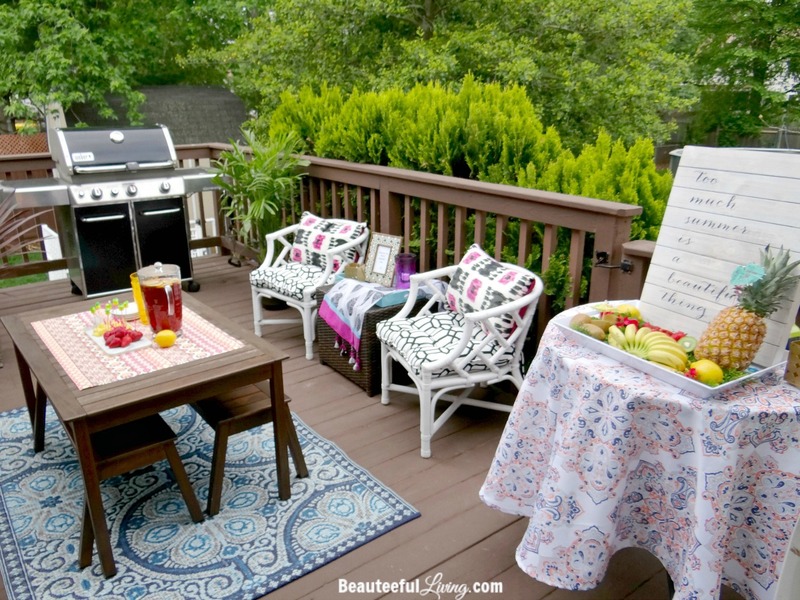 Hi Patti, the Deck Over paint holds up very well on the deck ledges and spindles. The only area you may need to retouch ever so often (maybe every 2 years) would be the floors (for obvious reasons). The paint is pretty thick so it coats the wood deck quite well. Hope this helps! I’m in the northeast as well, but I’ve had issues with wind knocking my decor and curtains.. has this been an issue for You? Hi, the outdoor curtains have not been a problem for us outdoors. We just took them down in the beginning of October because it got too cold out. Using tip ties on the top where we have the curtain rod secured really did the trick. Thanks for reading and for your question! Roxie does look adorable out there!! I love this but I am curious what you are going to do with the tropical plants if you are in a cold climate. I would have no place to put them. Hello and thank you for taking the time to comment. It’s been so warm in the Northeast that all of these tropical plants are still outside (holding out pretty well in fact). I plan to bring half of them indoors. The palms will just be left outside. At $12 each, they are a steal compared to roses that only last about a week. I buy them each spring and they last through fall. Thanks again for commenting. Absolutely gorgeous!!! What a flair for decorating. I wish I could do something like that. Can I hire you? Can’t stop looking at it. Thank you so much for your incredibly sweet comment. I do consultations on home design/styling work (virtual as well as in-person). If you are interested, please email tee@beauteefulliving.com to provide scope of project. 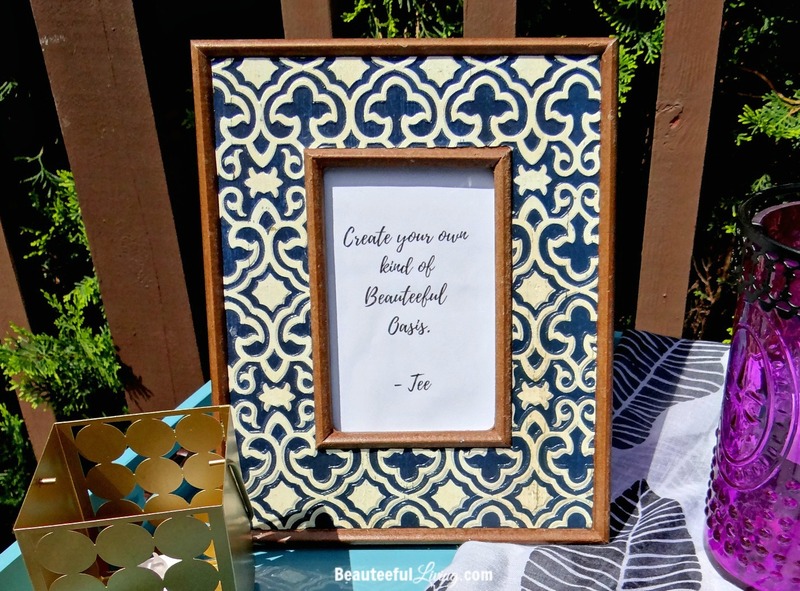 But if you’re just looking for home inspiration, please subscribe to Beauteeful Living’s email list. Thanks again for taking the time to comment! This was such a fun makeover. I wish it was summer already :). OH my gosh! This is by far the most beautiful outdoor space I’ve ever seen! I love it!!!!!!!! You must be in heaven when you’re out there! What a beautiful and festive space you’ve created! I love it! That is a fantastic outdoor space! May you have many happy times enjoying it! Who needs Aruba! Love the serenity you created within your own home. I love your choice of colors. Is that rug made for outdoors? Thanks so much, Jay! 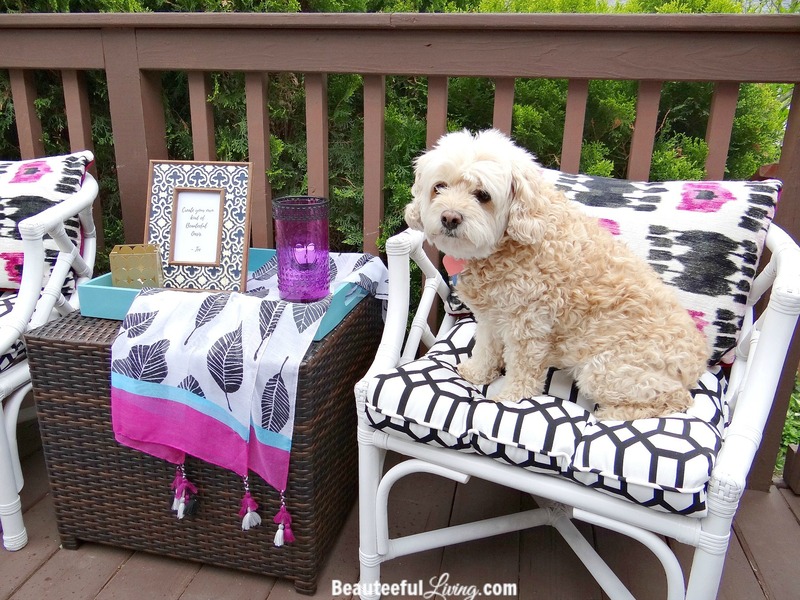 Yes – both rugs are outdoor rugs. Let’s see how they do after the summer ;). It looks absolutely wonderful Tee! What an awesome backyard space for your family to enjoy!!! 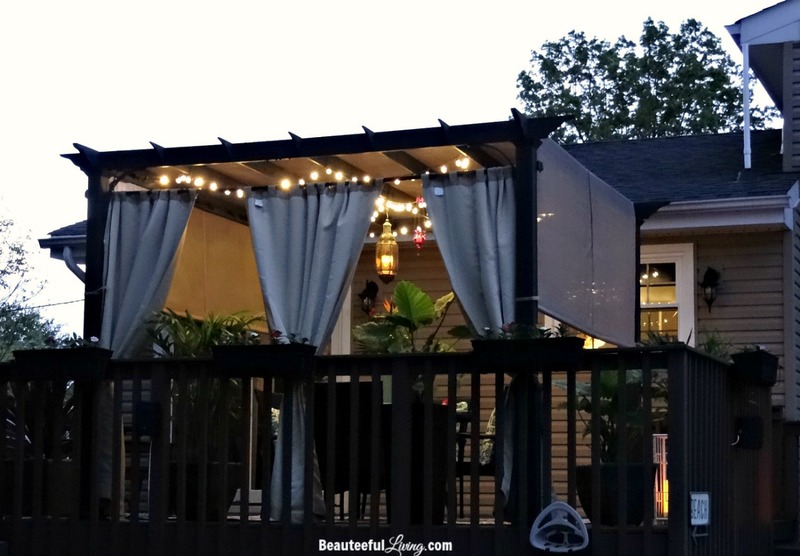 You have totally created an outdoor oasis, and you’re right, you don’t need a summer home because you have everything you need to relax and have fun right in your backyard! 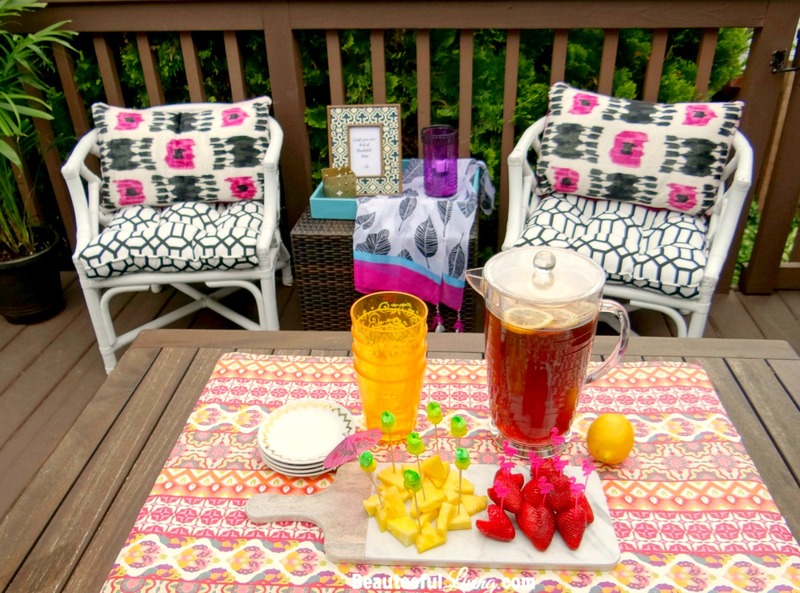 Tee, You have achieved a tropical oasis without leaving your backyard. Job, well done! I’m sure you’re the envy of your neighbors. Everything is totally beyond gorgeous! Thanks so much for the sweet compliment! Congrats on completing the ORC too! Loved how your makeover turned out too. Wow Tee, this is amazing! Such a colorful and happy space. 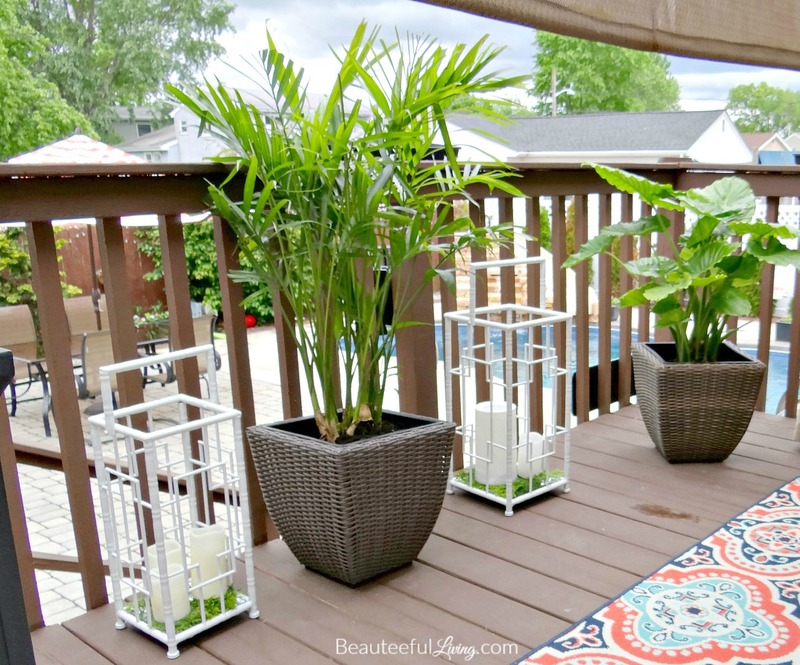 I need to update our deck this summer and it is so great to see how to take a plain space and make it something amazing! Great job! Thanks so much, Brit! I can’t wait to enjoy this space consistently once we get some (consistent) warm weather :). 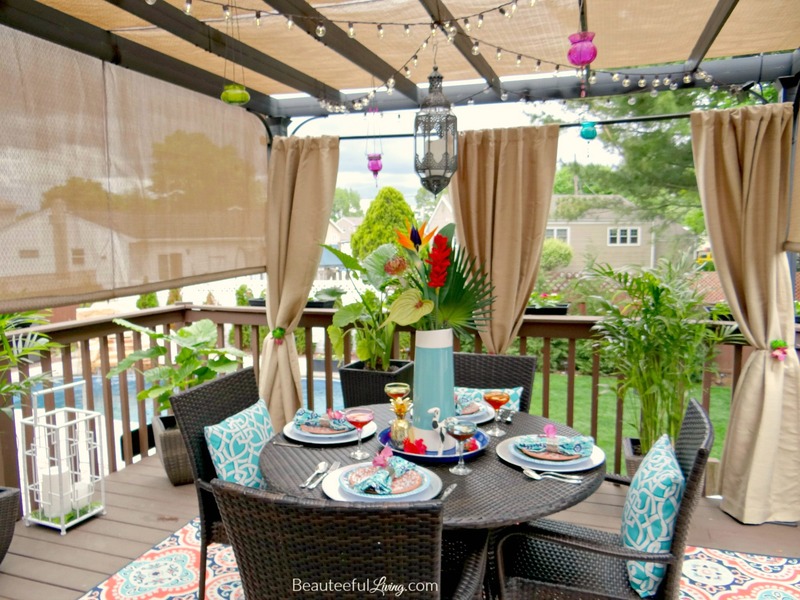 Have fun with your deck makeover this summer. It will be fab, I’m sure! What a difference! Such an amazing fun space. 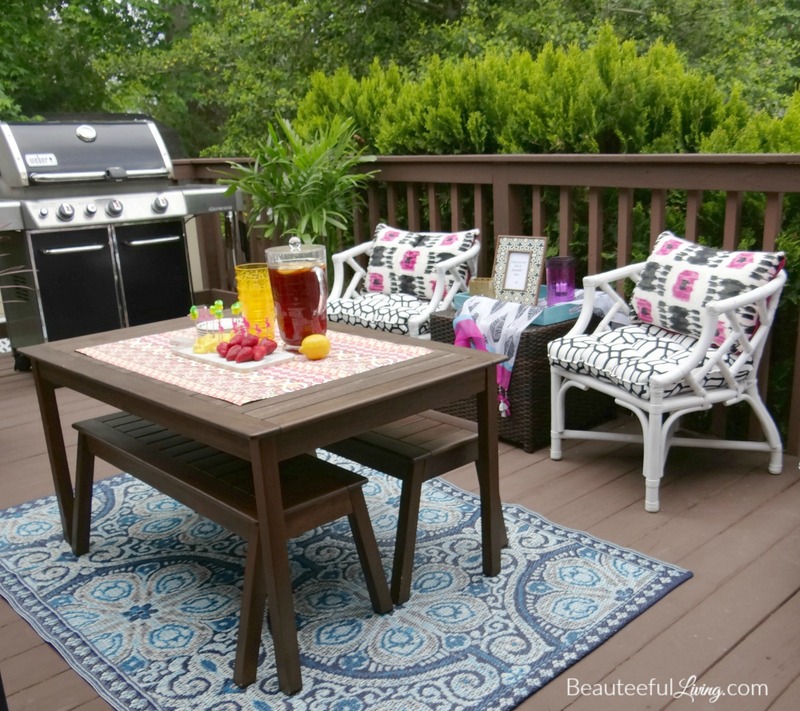 You are going to have a fabulous summer enjoying this outdoor space! I’d be out here every night enjoying a cocktail! such a fun and inviting space! Thanks so much, Bre! I just need the weather to warm back up again! Can’t wait for summer! 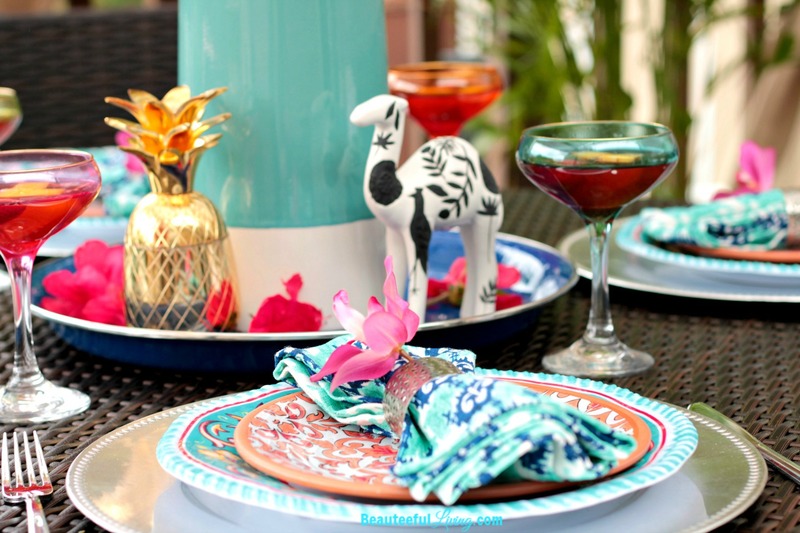 I love how your tropical dining area turned out! 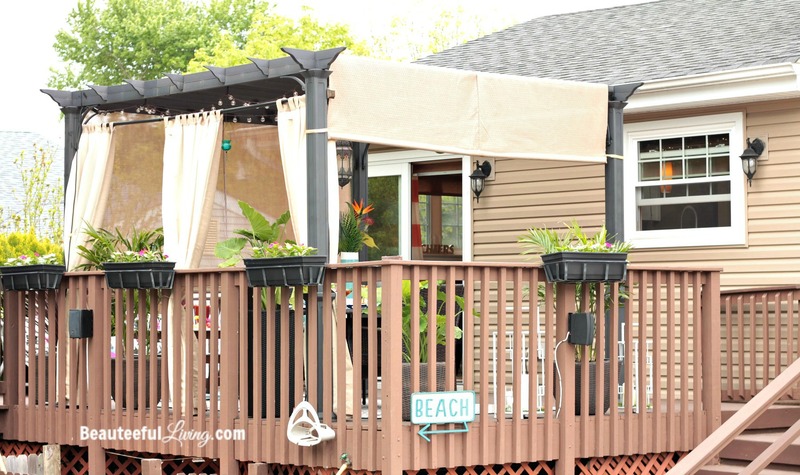 Now you have the perfect place to enjoy summer days and evenings! Congrats! What an oasis you have! It’s all good! 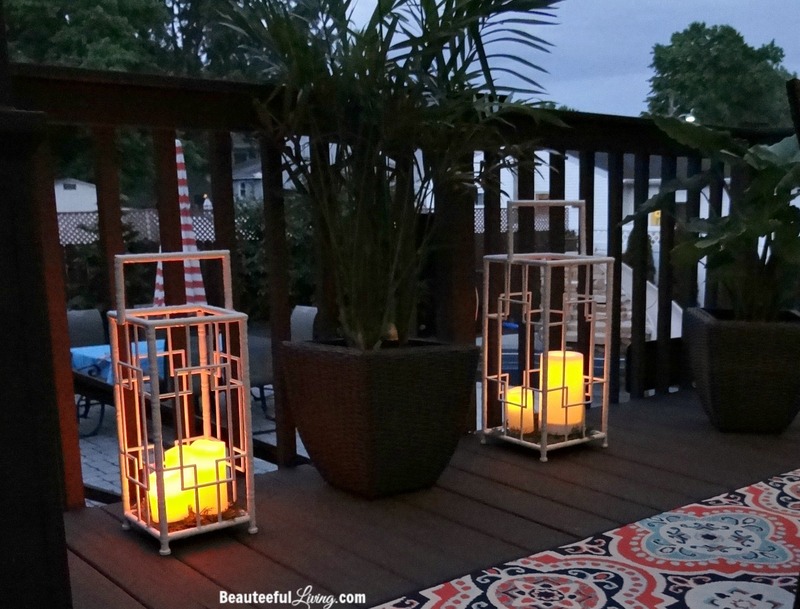 I think my favorite part are those bamboo lanterns – I’ve never seen anything like that! Thanks so much, Ashley! I’m so glad I happened to stumble across these lanterns. They were the only 2 in the store :). Thanks so much for your sweet comment, Sarah! Good luck on your outdoor space. I bet it will come out gorgeous! This is gorgeous! You did an outstanding job! I love all the styling and the nighttime photos are magnificent! Thanks so much for your sweet comment! I love being out there in the evenings now :). Tee, this turned out beautiful! What a lovely space, Nice work! Thanks so much, April! This has been one of my “most fun” ORC makeovers. I guess I just love being outside..especially when the weather is nice! This backyard is STUNNING! 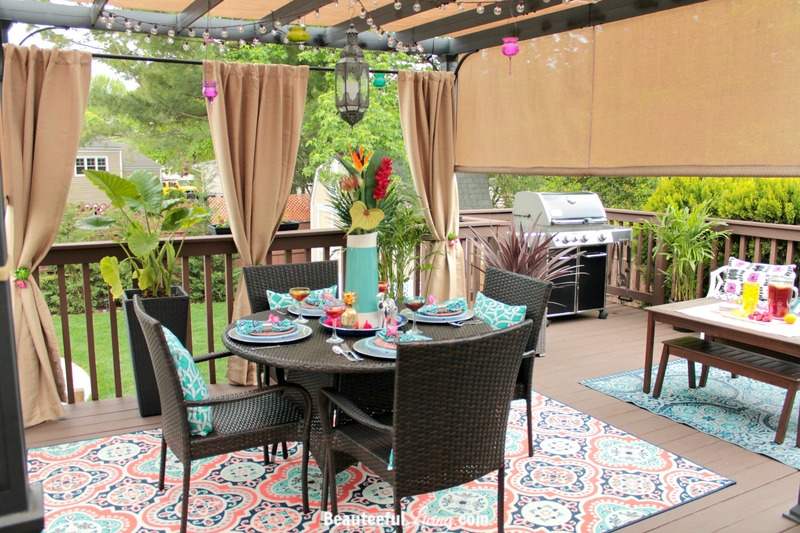 The mix of colors and prints is so much fun, and it looks so gorgeous in the nighttime pictures with the lanterns on. Thanks so much, Kate! It’s been so much fun following along everyone’s progress the past 6 weeks! Thanks so much, Kristen. I can’t wait for summer to arrive! You can stop over anytime, Diane. Haha. Thanks for commenting and checking out the reveal! Love the hanging lantern. 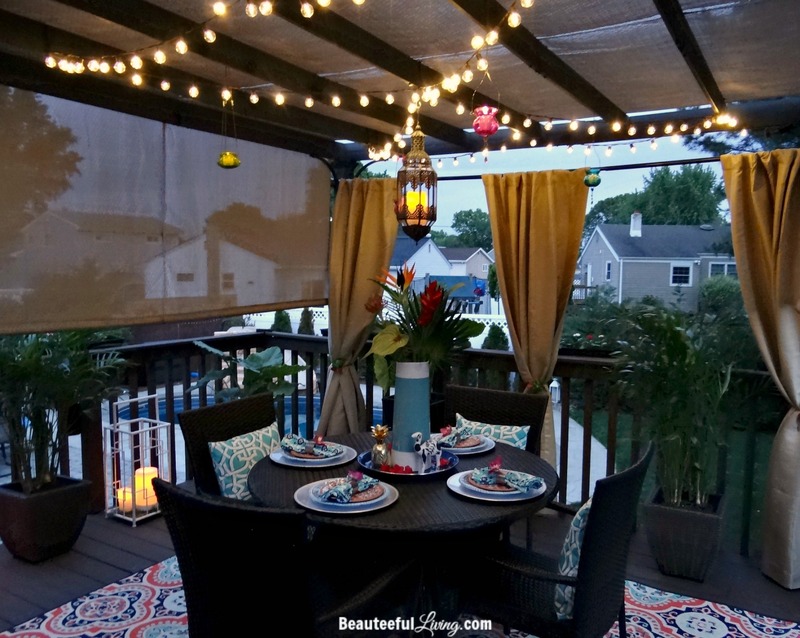 I have hanging lights like that too, favorite part of your backyard. Thanks so much for commenting and checking out this project. I appreciate your words of encouragement. Thanks so much, Susie! I can’t wait to enjoy the outdoors with warmer days ahead. Hope you’re enjoying your fabulous great room! So much fun following along everyone’s projects the past 6 weeks! This is absolutely stunning! I’m in love with all the right bold colours you used in your decor. Fabulous job!!! Thanks so much, Sue! This was such a fun makeover to do. I live outdoors all summer. LOL. Congrats on your makeover too. Such a beautiful girl’s room you did! It’s gorgeous, Tee! What an inviting spot to hang out in! I love all of the plants so much! 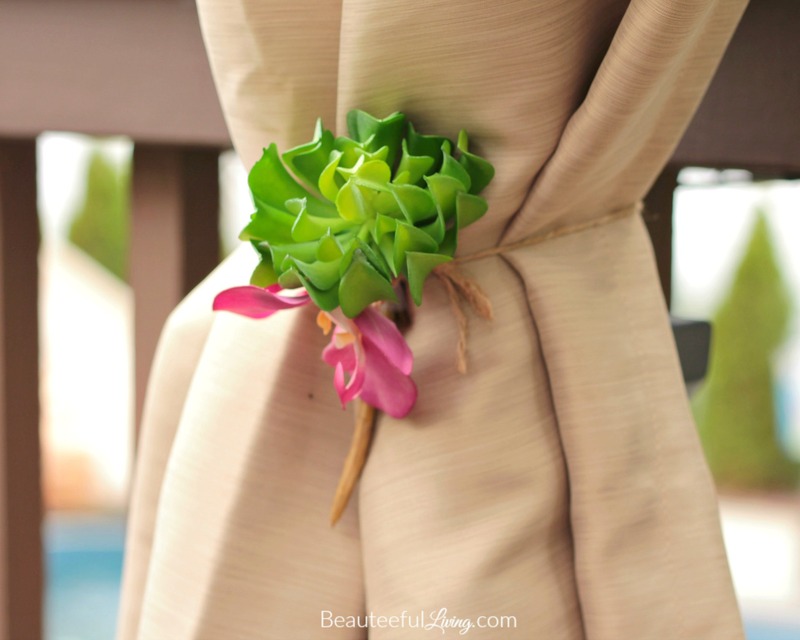 The curtain tie backs are so cool! Great job! I love how you made this space so usable and practical but still pretty and with so many amazing accessories!!! Thanks so much for your sweet comment! Congrats on your makeover as well! So much fun following along the past 6 weeks! Thanks so much! Yes, so glad this space is done just in time for warmer months ahead! oh tee, it is magical! what an awesome outdoor space! i love the privacy the curtains add, the ambience the light brings, and all of the gorgeous summery bright touches! those lanterns you scored are fab! You’re the sweetest, Cassie. Thanks so much for your words of encouragement! It’s been so much fun following along everyone’s progress these past weeks. Congrats on your makeover! Thanks so much, Ariel! This has been so much fun. Maybe doing the challenge in the spring isn’t such a crazy idea after all :). Congrats on your makeover!